Christmas is fast approaching, so it’s time to start preparing for the holidays! Packing might be the last thing on your mind, but it’s important that you don’t leave it until the last minute. Our checklist will make sure you don’t miss anything, and help you get everything organised before you leave uni. Clothes: pack for the season, and don’t forget your Christmas pyjamas or onesie. If you’ve got a job or interviews lined up for the holidays, include some work outfits. And, you could think ahead by swapping clothes with your stock at home – trade light Autumn wear for some warmer items. Toiletries: from your favourite shampoo to makeup and deodorant, these are key to the line-up. Meds: allergy medication, painkillers and more all need to travel with you. Tech: your phone, laptop, iPod and tablet should go on your list, and their chargers. If you’ve got games consoles, sound systems or other tech that you can’t take home, why not use our storage service? Documents: don’t leave anything important in your uni room. Pack your passport, driving licence and any other forms of ID. Plus, make sure to remember your travel tickets. There are some parts of student life that you just can’t escape over Christmas. Organise your deadlines for uni work – and the course books you need to do it all – in advance. It’s easy to overdo it, but don’t pack any more than you need. You should also pack any food that will go off before you return. If you don’t have any room, invite your flatmates to help you eat it all! And, your flat keys should be the last thing you pick up before leaving. Enjoying the break with family, friends, and food is important. You could put together photos, physical or digital, in a scrapbook or album to take home. It’s a great way of sharing the best moments of your last uni term with loved ones. 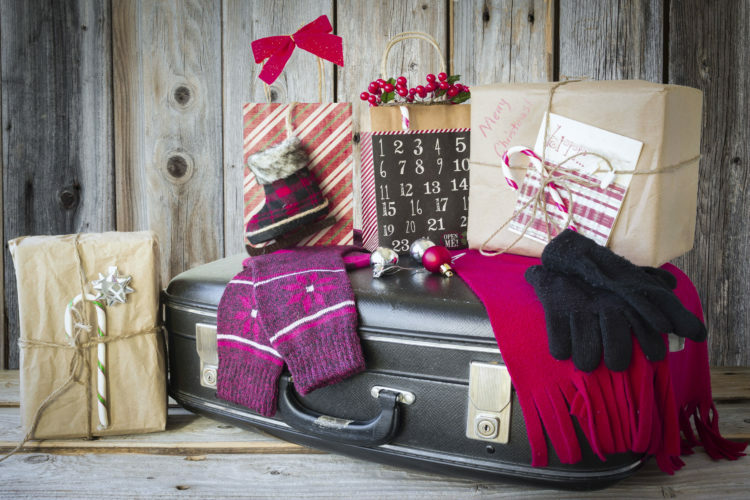 But, one of the most memorable parts of Christmas is something you might forget to pack: presents! Make sure you leave space in your suitcase for anything you’ve bought while at uni. Buying online and getting things delivered to your home is also a handy option, which might prevent last-minute stress. You could write out a checklist or use a Notes app on your phone to help you keep track of your packing. Tick things off as you work, so it all goes smoothly. Need to keep your belongings safe over the holidays, but can’t carry them home with you? Everything from bulky musical instruments to expensive technology can be difficult to pack. Use our student shipping and storage service to take a weight off of your mind, and out of your suitcase. Contact us today to get a quote.